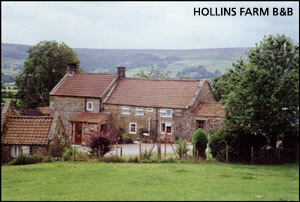 Hollins Farm, is located approx. 9 miles from Whitby. Places of interest include the steam railway, Heartbeat country and National Park centre. It is one and a half miles from Glaisdale village, here there is a good butcher and village store with post office. A pub provides meals and there are also 2 garages and a tennis court. A free ride to the pub for evening meal is available at 6pm. Please send a S.A.E. for details. 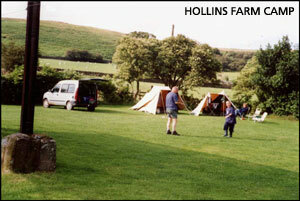 We also provide good camping facilities for tents only. The amenities include toilets, showers, dish washing area, fridge for milk and TV room. Camping �2.00 per person per night. A free ride to the pub for evening meal is available at 6pm. Please send a S.A.E. for details. Bed & Breakfast from �21.00.